Hi Miyu, how so much cute you are!!! And your hat is an adorable. Mai, your little Miyu is just the cutest! You're very clever to be able to adapt the hat pattern for her - it looks so sweet. Well done! Soooooooooooooooo beautiful, your daughter! Congratulations and a big kiss for you. My goodness, your baby is so cute! I love the hats, too. Very sweet! Whoops, that first one got all messed up. Miyu is so, so, so CUTE. I know we all say that every time you post something, Mai, but she is. Anyway, that hat is great! If you have time will you share the pattern or a tutorial for it? Thanks! 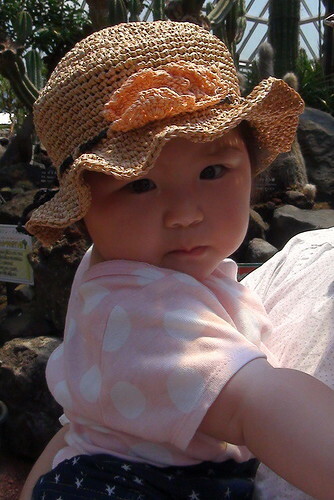 Hi Mai -----Miyu is very cute and pretty - just like her Mama. The hat is a darling as well. She will be walking soon. I love your blog a lot. 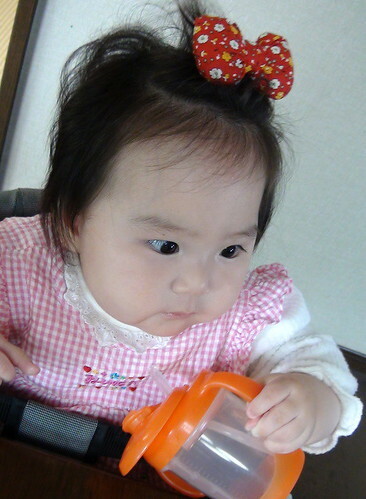 Thank you for sharing photos of Miyu's progress. Miyu is adorable. And do are those hats. I also think it would be great if you posted a tutorial on how to make them, if you have the time. Miyu is beautiful! Don't worry about her not crawling yet. My little boy was very chubby at that age as well and was not very mobile. He is turning 3 next week and is as active as they come. 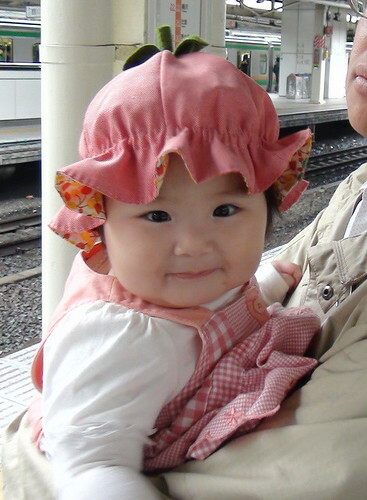 Dearest sweet mai, miyu looks soo adorable and pretty in her strawberry hat! I love it! Have a lovely merry happy weekend and love to you! The strawberry hat is lovely! An Miyu looks so sweet with it! I love the hats you made!! Miyu looks so cute in it!! Mai, My son was just like Miyu when he was little. Watch out! He went from not moving very much to standing and running. No crawling like other babies and today he is a grown man who runs marathons! I love her little strawberry hat and the one that your mom made too. I'm glad that you and your family are safe and doing well. I've found the smartest people started out as babies just waiting for others to come to them. My mother taught me that ages ago and with my 9 children, I was more concerned when they were early walkers. Those of mine who waited to walk are doing better than the earlier walkers. She is ADORABLE and knows she has NO need to move. Miyu is very fortunate to have you as her mother. You sew lots for her. I see you enjoying motherhood. Great! I heard it's almost 梅雨 in Japan? Take care and have your umbrellas ready! 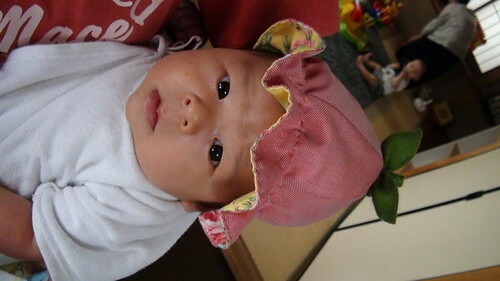 Miyu looks so cute in her new hats. She not only has a clever Mummy, but a clever Granny too. She is more adorable each time we see her. The hat it´s so nice and useful. What a sweet looking hat you have made for your sweet baby! Miyu looks adorable, specially with the strawberry hat!!!!!!! I like the one your mom made too!!! 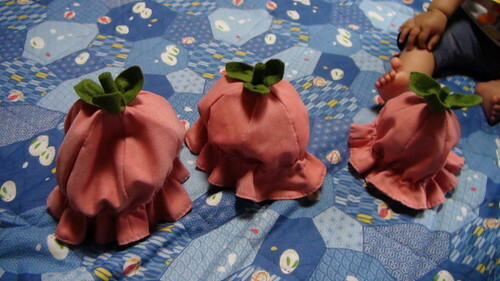 Can you tell me the tutorial for making strawberry hats? I want to make one like this for my daughter (she's 3 years old).